Welcome to the second installment of WRI’s six-part blog series on the future of tonewoods, the woods used in guitars and other musical instruments. In each installment, we look at a different species of tree used for a certain part of the guitar. Each wood presents its own challenges and possibilities surrounding sustainable harvest. Building an acoustic guitar means considering the tonal balance of the wood as much as any structural properties. Guitars are traditionally made from several different tonewoods. In select cases, however, the guitar body can be made from just one wood. It has to be stiff and light enough for the soundboard (the top of the instrument), yet flexible and hard enough to be bent to make the back and sides. This delicate balance makes single-wood bodies rare and difficult to design. The Hawaiian koa tree produces wood with all these qualities, and has the potential to be harvested sustainably. Koa (Acacia koa) grows exclusively on Hawaii, and is the most commercially important tree species on the islands. In this biodiversity hotspot in the Pacific, koa is crucial to the survival of many species found nowhere else on Earth. Hawaii’s forests are home to more than 10,000 unique species and one-third of the plants and birds on the U.S. Endangered Species List. But due to the invasion of non-native plants and animals, habitat loss, and deforestation, only 10 percent of the koa forests present when the British explorer Captain James Cook arrived on the islands in 1779 are still standing. Koa was historically used in canoes dating back to the first Polynesian settlers on the islands, and in the first surfboards. The tree has long been a symbol of native Hawaiian culture and identity. Guitars made from koa were an innovation of the early 19th century, when Mexican cowboys known as paniolos (from españoles) came to the islands to help wrangle livestock. They brought their own language and culture, including their guitars. Native Hawaiians combined elements of these Spanish guitars and Portuguese steel-string instruments to craft their own instruments out of koa, including the slack-key guitar and the ukulele. These koa instruments are intrinsic to the enduring sound of Hawaiian popular music. That characteristic island sound got a boost during the Hawaiian Craze of the 1920s, which spurred a consumer appetite for Hawaiian products on the U.S. mainland. Demand for koa has steadily increased since then, far exceeding the small supply currently available. Cherished by woodworkers worldwide for its shimmering appearance, koa has found a new market as a component of guitars. It is quickly gaining attention as an alternative tonewood to the traditional Sitka spruce (which we covered in the first installment of this blog series), and sales rose after pop icon Taylor Swift began playing a koa guitar in 2006. This new demand has been accompanied by significant interest in the reforestation and sustainable harvest of koa. U.S.-based manufacturers like Taylor Guitars are envisioning Hawaii as a possible domestic source of exotic hardwood. Hawaii’s adherence to U.S. forestry and trade laws gives Hawaiian-grown koa an advantage when compared to tropical hardwoods from conflict- and corruption-ridden countries. Taylor Guitars has joined Pacific Rim Tonewoods in the Paniolo Tonewoods project in Hawaii, which seeks to establish sustainable sources of koa in the islands. The joint venture is also researching the eventual cultivation of valuable mahogany, rosewood and ebony in Hawaii. Entirely sustainable koa harvest and propagation is decades away, but good actors are starting to take important strides towards well-managed hardwood forests in Hawaii. 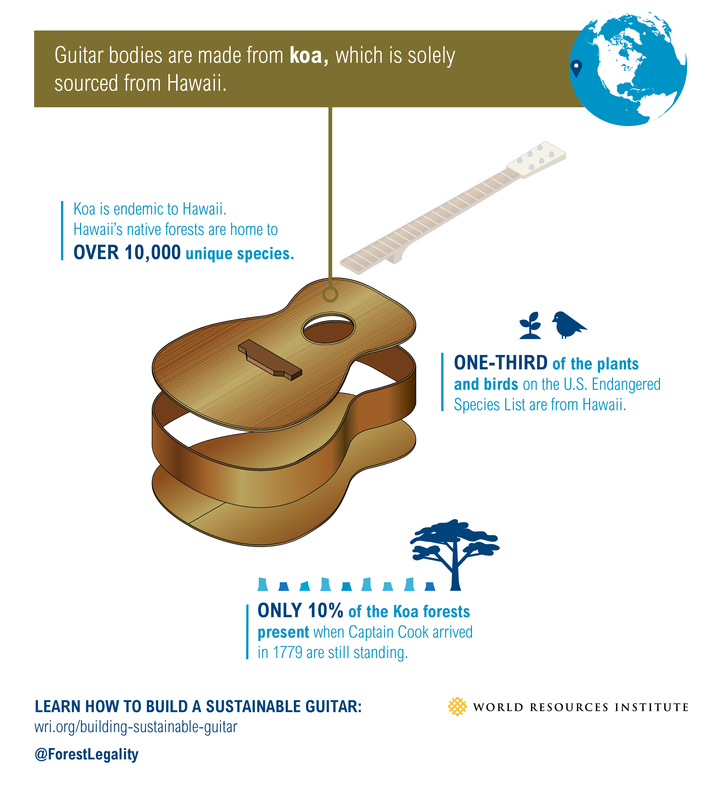 Koa forests on Hawaii have the potential to become a source of entirely sustainable tonewoods. Ever wondered what Thomas Jefferson and Eddie Van Halen would discuss at breakfast? Find out in the next installment in the series when we visit the U.S. Pacific Northwest.